2 & 4 Day courses are tailored to suit you and your horse, and are a great learning experience for all that attend. It’s amazing what you can achieve in just a few days aiming for lightness and clear communication. This is a perfect opportunity to take full advantage of the safe facilities at Old Shawls Farm and work on any issues you may have with your horse, bring your friends with their horses too or just to enhance that special relationship between you and your horse or pony. Horsemanship Courses pagefor the latest dates and more information on all the different courses we offer with or without your own horse. Horse & Owner 2-day course: £250 – Inc DIY livery for your horse, hay, straw and free (self catering) accommodation for you in our wooden cabin. Horse & Owner 4-day course: £500 – Inc DIY livery for your horse, hay, straw and free (self catering) accommodation for you in our wooden cabin. 2 day 1-1 course: £500 – During this course you will have John’s full attention to work on building a perfect partnership between you and your horse or pony. Inc DIY livery for your horse, hay, straw and accommodation for you in our (self Catering) wooden cabin. Click here for a full list of nearby B&Bs if you would like more luxury. 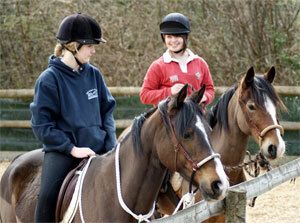 Children under 18yrs are welcome to come and stay with their horses and ponies with a parent or guardian present.